BÀ RỊA - VŨNG TÀU — The second body of a crewmember from the wrecked ship Hải Thành 26 off the coastal province’s waters has been recovered by marine rescuers and returned to his family yesterday afternoon. The seaman was identified as Ninh Văn Quyền, born in 1989, hailing from the northern province of Hải Dương. 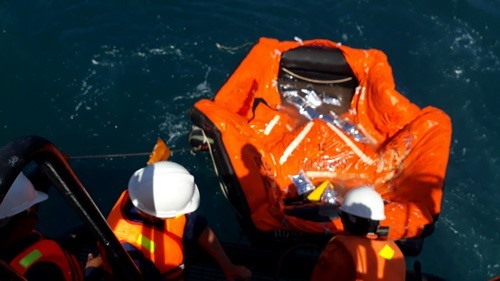 Earlier yesterday, the body of the ship’s vice captain Lương Văn Quỳnh was the first to be found, said an official from the Việt Nam Maritime Search and Rescue Co-ordination Centre. Vũ Việt Hùng, the centre’s director said rescue and search plans are underway both on the surface and inside the sunken ship. The 3,000 tonne-transport cargo ship sank at midnight on Monday and is currently 30 metres under the Vũng Tàu sea, reportedly after colliding with another cargo ship. Two days after the accident, a marine rescue ship located the wreckage. The accident struck while the ship – with a total of 11 crewmen on board – was sailing from northern Hải Phòng City to southern Cần Thơ City. Rescue efforts were hampered by high waves and strong winds, officials said.